My parents live in the same house that they built when my mom was pregnant with me, and no one in my family really did much moving when I was younger, so I have a hard time letting houses go. When each set of grandparents sold their house in Florida, it was sad, and I didn't like it. When my Mamaw and Papaw sold their house in Auxier (the house that my mom had grown up in) to move to Grayson, it was sad, and I didn't like it. Yet somehow, seeing the For Sale sign in Gurnie's yard when I was home this weekend was the saddest. It's not like I didn't know it was happening. When she died in September, we'd talked about selling the house. When the family got together at the end of October to go through the things in the house, we talked about selling the house. Over the past few months, I've often talked to Mom and Dad about things they were doing to the house to get it ready to sell. When they had the estate sale a couple of weekends ago, I knew selling the house was the next step. But seeing the sign in the yard was just weird. Thinking about someone else living there is even weirder. Gurnie and Papaw's was basically my second home growing up. It's where I learned to ride my bike. It's where (SPOILER ALERT) I learned there was no Santa Claus. It's where I got my first scar when I fell in the dining room and bit through my lip. It's where I practiced my reading skills by watching Wheel of Fortune with my Papaw (yes, I'm serious), and where I learned to love game shows in general. It's where I stood on a wicker stool and cut my first gingerbread man out with a cookie cutter. It's where I played in the basement for hours on end, pretending that with its bathroom and second kitchen, that it was my own house. It's where I sat at a picnic table on the patio and had tons of watermelon, the best homemade ice cream, and once a McDonald's hamburger with a little dirt on the bun. (You can ask my brothers Chris or Brent for the full story there!) 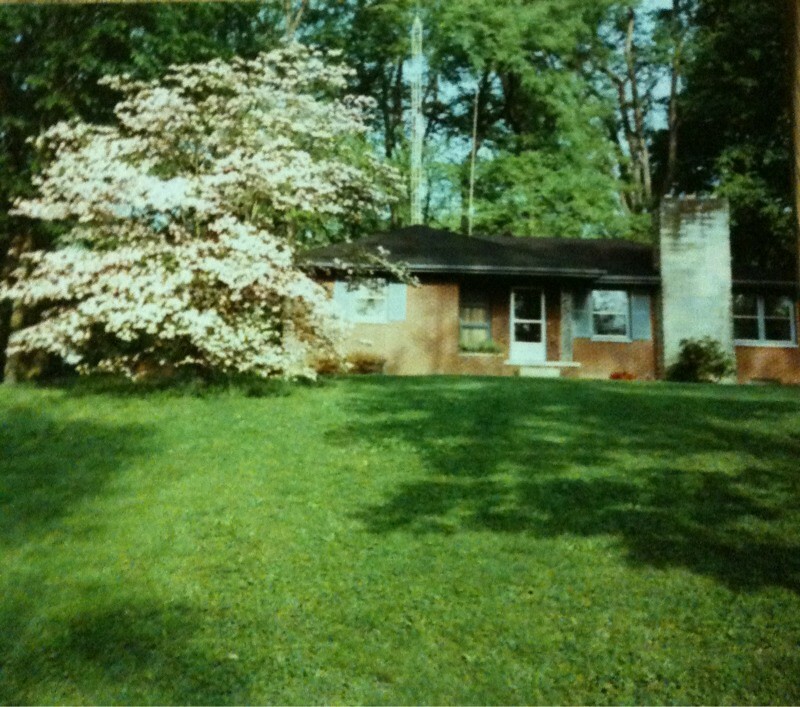 I remember when the huge den was a just a garage, and when the laundry room was Papaw's TV room (with those sliding glass doors on both sides I could see everyone driving down Landsdowne... and when I turned 16, my grandparents could see every time I took the first curve of Shady Lane too quickly). The house was the starting point of too many Florida trips to count, and always my last stop before heading back to Lexington. But time moves on... the tree that I loved to climb isn't even in the yard anymore, and the croquet set we played with as kids sadly never turned up. And soon one of those daily phone calls my parents gets about the house will be from someone who will actually buy it. So if that person ever stumbles upon this blog (hey, stranger things have happened), just know that when you buy 405 Landsdowne, you're not just getting a brick ranch house with the best yard in Grayson... you're getting my childhood memories too. Oohhh! The tears! We only lived in our last house for 3 years, but selling it and watching it go was the hardest thing I've ever had to do. I hope the buyer does stumble upon your blog, because every new house is someone else's treasure. I'm calling my Mamaw right now :) I can relate to all of those memories. btw...totally made me think of "The House that Built Me" by M. Lambert...just ask Heather I have a constant soundtrack in my head and relate everything to song. This made me cry! What wonderful memories! Oh, I'm crying too!!! I felt the same way when my grandparents sold their house in Willard. My dad was raised in that house and I spent many Saturday mornings waking up to the smell of bacon frying in the kitchen. It breaks my heart that Macy will never play on the same tire swings that I did or climb the same trees that I did. But I like to think that Heaven will have a replica of that yard. I will pray earnestly that a wonderful little family will buy that house to raise their children in, where your memories can be relived over and over through the laughs and smiles of other children.